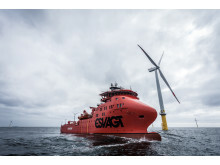 ”Esvagt Contender” and ”Esvagt Observer” in rescue activity in the North Sea. A British fishing trawler took on water, and two ESVAGT vessels were the first to come to the rescue. Credit to the crews for good seamanship.